The Sengoku Jidai, immortalized in saga and song, has inspired countless sword-and-samurai chanbara movies—so named because the hero’s theme music is inevitably “chan-chan-bara-bara-chan-bara-chan. (…) Japan was once a chanbara country: a land of noble warriors, ninja assassins, feudal lords, beautiful courtesans, and lots of castles. Castles hidden in valleys. Today, only a dozen are still standing. Many more have been rebuilt as tourist attractions, with varying degrees of accuracy, but it is the extant castles that are treasured. The old wooden boards creak under my feet, the low parapet and the height make me a bit dizzy for a moment. There is emptiness under me, but I feel pushed upwards to the blue sky by the cold wind. The view from the top of Inuyama Castle is fabulous. The height is just 19 meters, but the raised and dominant position on a hill multiplies the effect and you really feel suspended in the air. 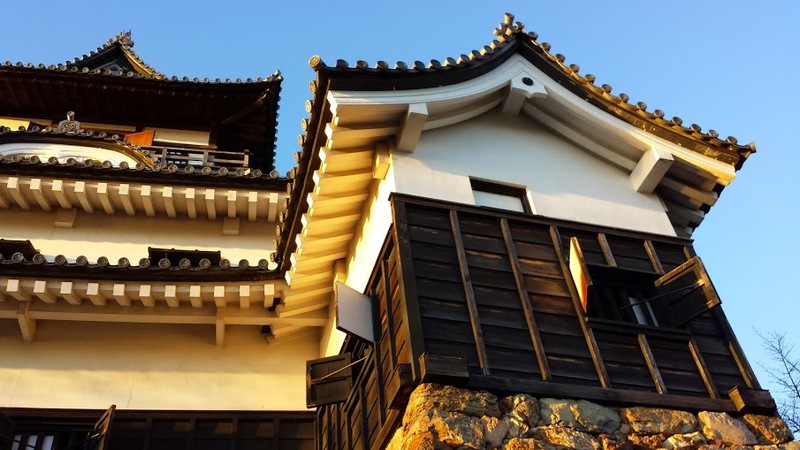 It might not be celebrated and famous as the spectacular Himeji castle. And it is certainly doesn’t inspire the same awe. Indeed it’s small, and its beauty is somehow timid. And it has a secret that is not immediately obvious: the treasure of this small city, thirty minutes by train north of Nagoya, is the oldest surviving castle in Japan: it was originally built in 1440 and later extensively modified in 1537 (and then again later). The castle is one of only four in Japan that are designated as national treasure. 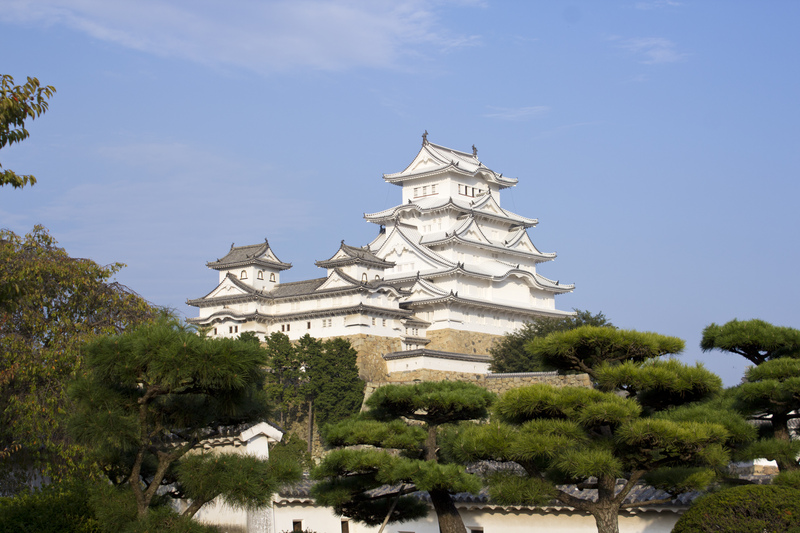 Next to Inuyama are more famous castles, such as Matsumoto, Himeji and the smaller Hikone Castle. They are part of the only 12 ‘survivors’. Others have been rebuilt (like that of nearby Nagoya), while other cities today have parks where castles used to be. Only the stone foundation and walls are still visible (like in Tokyo or Fukuoka). Because Japanese Castles weren’t made of stone. Japanese castles are not the dread granite bastions one associates with Europe. Japanese castles are delicate in appearance, like decorative wedding cakes poised above the treetops (…). The usual plan was to build the tallest wooden structure possible on the highest hill you could find. And they wondered why lightning kept hitting them. Castles were destroyed by natural disasters, fires (lightning! ), feudal wars. Then came the modernization of the Meiji era: at the time someone decided to clean up these cumbersome memories of the past. And finally American bombings destroyed a couple of dozen more. This is why only 12 were left untouched, most of them among the smallest and least ostentatious. They are the ones I love the most. The trip to Inuyama along the Meitetsu line is short but fascinating. I met my brother in Nagoya where he, for an incredible coincidence, was on a business trip and had a few hours off. And a few minutes after we left the station we entered the Kiso valley and immediately the big buildings, the concrete blocks thinned out. The elegant traditional-style houses appeared, with their heavy tile roofs. Inuyama looks quite ordinary, but sits in an agreeable position in the valley: the Kiso river is on one side, and the mountains on the other. But this city has, as we said, has hidden treasures: mainly the castle and the Urakuen garden with the famous Joan tea room. The castle and the garden are about twenty minutes on foot from the station. Then the centuries-old profile of the castle emerged. It’s the Inuyama-jo, small yet majestic, elegantly set on a hill overlooking the city. It’s surrounded at the base by some ugliness: roads, concrete, asphalt but it doesn’t harm its beauty. We passed through a Torii and entered the enclosure of a Shinto Shrine. Then, after a steep climb, we reached the entrance. The castle seemed smaller now. The interior was empty, bare. It was like a white screen on which I let my imagination run wild. 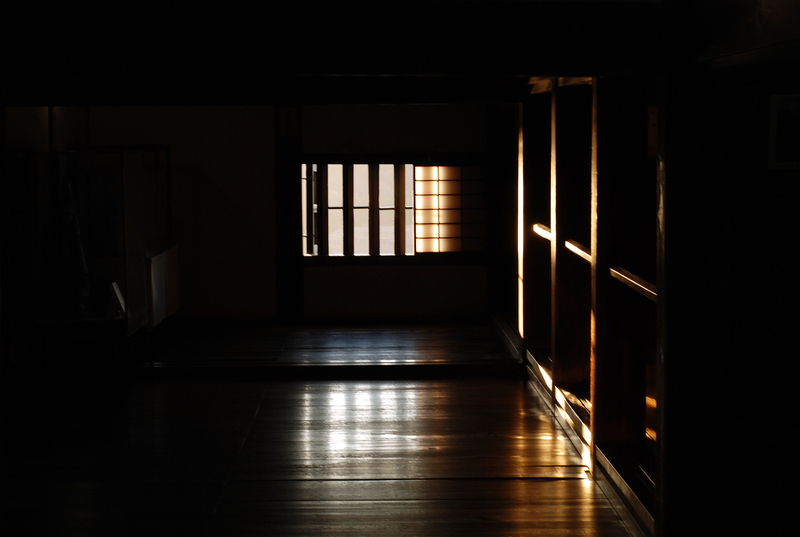 I climbed up steep wooden stairs, imagining samurai wandering around the rooms and, why not, hooded ninja assassins lurking in the dark. And now I am here on the top, like suspended in the air. I can see the city, the valley. From this same point once tireless eyes looked for enemies, armies. I also hear sounds. The cars, the words of people carried by the wind, the rustling of the trees. But there is more, like a distant music… “chan-chan-bara-bara-chan-bara”. Inuyama is linked with Nagoya by the Meitetsu line: 30 minutes, 550 yen (the Japan Rail Pass is not valid on this line). The ticket costs 550 yen, 1.300 if combined with the garden. Open 9-17.